A quick review of Pike and Wayne Counties lured us into the belief that (in contrast to the many challenges we faced in a “large” County like Luzerne) – these two would be ‘a piece of cake’. We decided to do them together! How hard could it be? We had been in the office for eleven whole days since visiting Luzerne – twice! It was time to explore new territory in the far Northeastern corner of Pennsylvania. Just to clarify, we referred to counties as “large” or “small” based, not on geographic area or population, but on the number of newspaper titles known to have been published in each county. 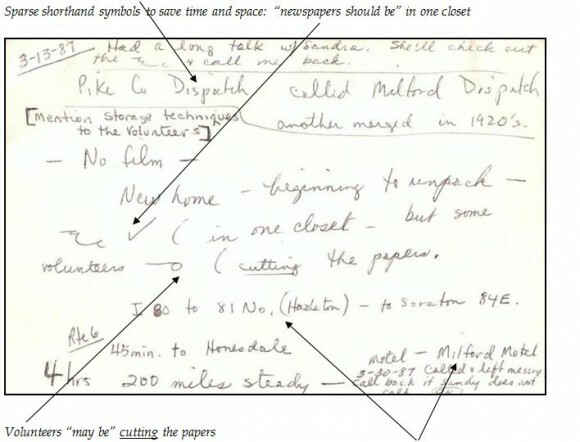 Numbers were based on information found in bibliographies and county histories. Luzerne had published 253 titles; Pike and Wayne – 15 and 38, respectively. Mailed out 413 Surveys LINK TO LETTER in HOW IT WAS DONE to institutions in our 10 Northeast counties – Susquehanna, Pike, Lehigh, Lackawanna, Luzerne, Monroe, Carbon, Wayne, Wyoming, and Northampton. 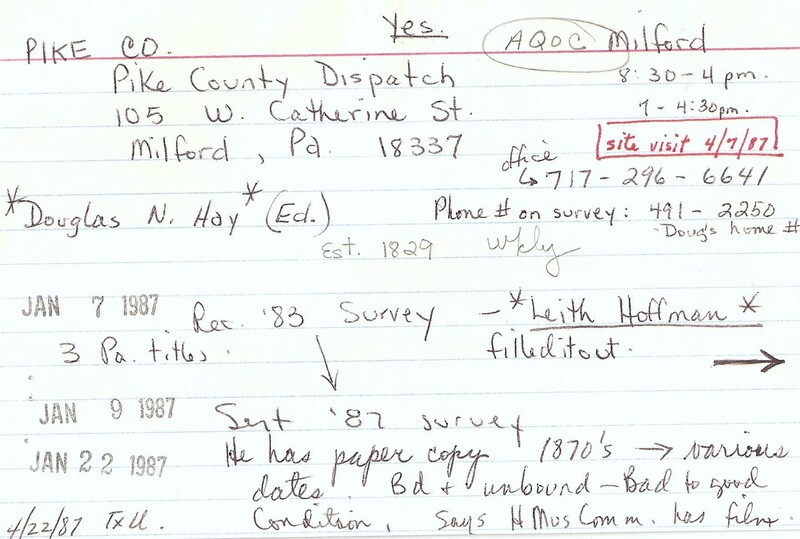 Mass mailings – questionnaires going to repositories in Northeast Pa., January 9, 1987. 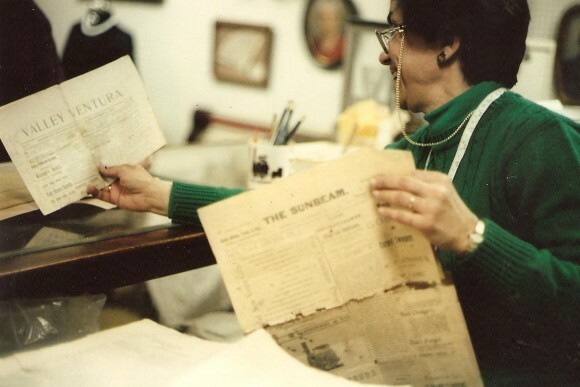 …Beck worked on tracking down a newspaper called the Miner (Wilkes-Barre). Well, after 4 calls to the brother of the publisher and the brother’s landlord back and forth, back and forth, Beck set a time for all 4 of us to meet at the brother’s apt. to go in and see the paper. 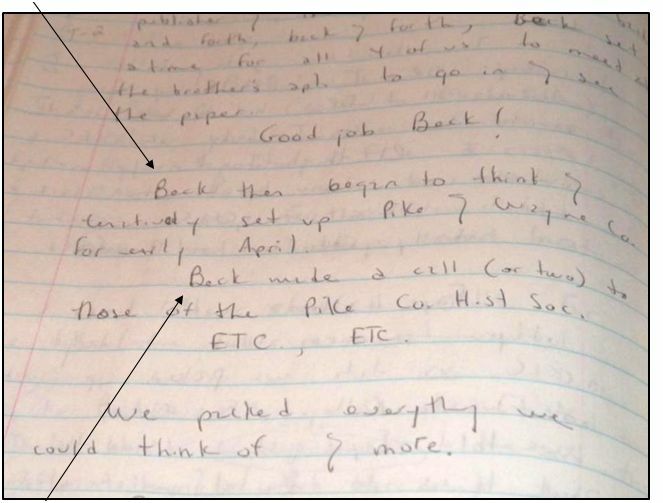 Actual Journal Entry for the transcribed page shown for Friday, March 13, 1987. 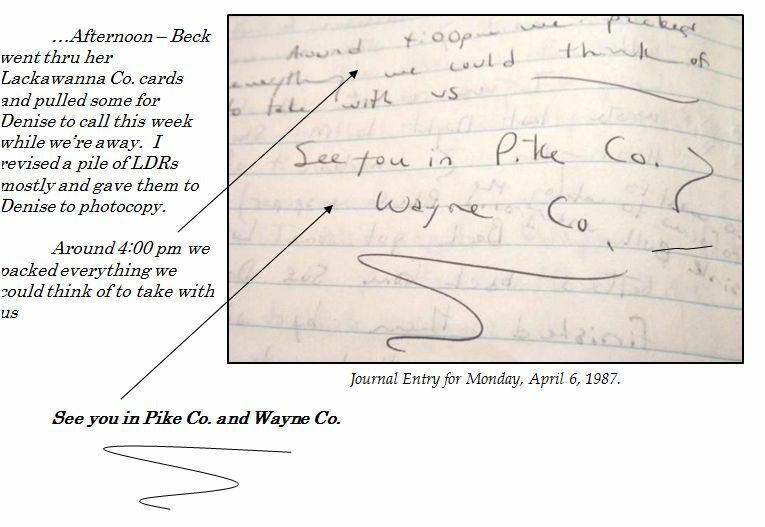 Beck then began to think and tentatively set up Pike and Wayne Co. for early April. Beck made a call (or two) to those of the Pike Co. Hist. Soc. ETC., ETC. … the rest of the day I worked on Luzerne Co. “Needs” and “Finds”. 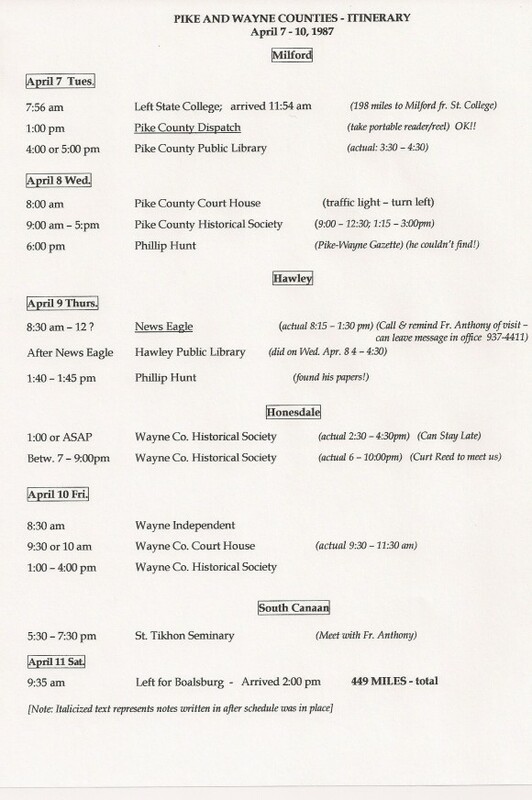 Beck began and nearly completed arranging our trip to Pike and Wayne County for early April. Beck got on the phone and was on all day calling and setting up site visits in Wayne and Pike County. We will go the second week of April…. …I worked on the NON-Luzerne County titles picked up. Cataloged and LDRed most of the stack. Also organized Luzerne Co. titles (159 titles) into smaller manageable stacks, i.e. Pittston titles together, White Haven, Plymouth, Times-Leader links, Standard-Speaker links together. This way it won’t seem overwhelming when we catalog. I did get a chance to search a few of these small packets on OCLC – so we can take some home to work on tomorrow (vacation – make-up day). 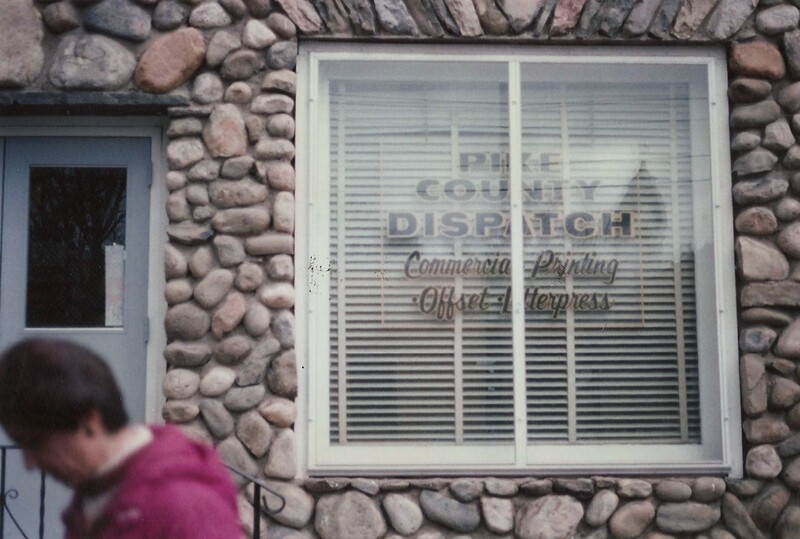 By 3:00 or so Beck finished setting up Pike and Wayne and started making calls to Luzerne Co. Thru her calls she found the Freeland Progress in N.J…. Beck got back on the phone and made calls to Pike and Luzerne Counties. Beck made the final contact to Pike County and confirmed the visit for next week. She then made at least one thousand calls to Luzerne County – trying to track down more Luzerne Co. titles. I began where I left off yesterday, cataloging and LDRing Luzerne Co. titles…. 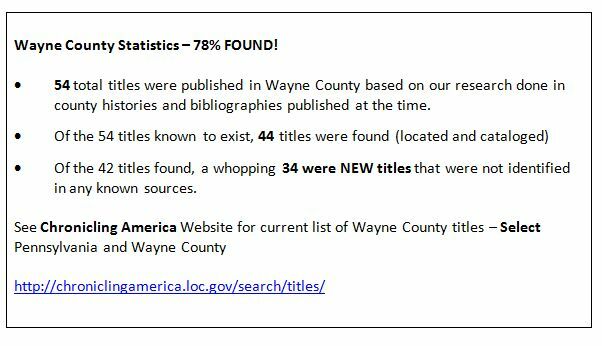 …Once Denise finished I searched OCLC – Pike, Wayne County titles, and Luzerne Co. stuff and at least a thousand other titles. Pike County looked so “easy” after Luzerne that we decided to do it in conjunction with Wayne County. Site visits are now in place for those counties for April 7 – 10. To the office – Beck and I both have so much to do (wrapping up Luzerne Co. and getting ready for, not just one county, but two, Pike and Wayne). Site visiting scheduled for next week. Beck was on the phone much of the day tracking down Luzerne County titles in Hazleton, Pittston and talking to people in Pike and Wayne Counties, N. Y., Florida, wherever. Beck gets so frantic some times trying to juggle all of this at the same time. I’m not sure how she keeps it all straight – but she does and does a damn good job of it. Beck also, in between phone calls, wrote thank-you letters to the people of Luzerne Co.
Denise worked on searching OCLC most of her time w/us. I worked on cataloging Luzerne County titles all day. I now have cataloged all titles from all towns except Hazleton and Wilkes-Barre. Breaking down the 160 titles into piles by town really allowed me to get a handle on the huge pile – this way it seems more manageable. 12:00 – 1:30 Denise, Beck and I out to lunch for Denise’s birthday. Her birthday was last week (March 25th). 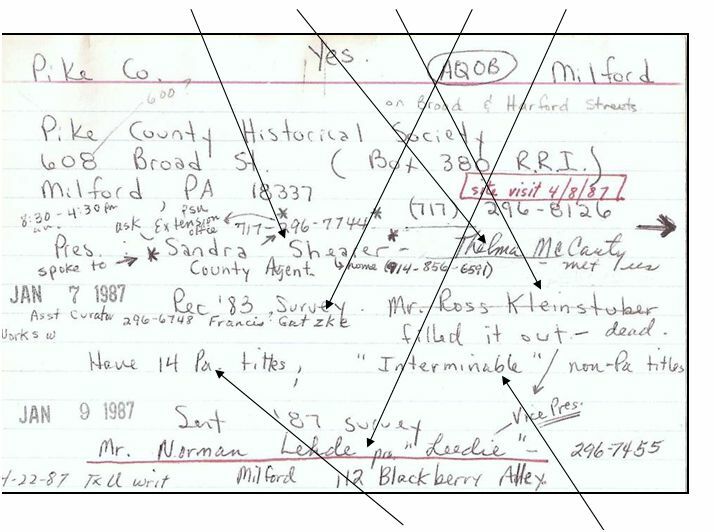 Beck continued her calls – Luzerne Co., Wayne Co., Pike Co., Florida, Arizona, Hazleton many times, etc. Beck was trying to track down the Valley Vigilant (Hazleton paper). After calling Arizona and talking to the former publisher – we found out he destroyed the entire backfile because it was a scandalous paper. Beck also arranged the pick-up of the Pittston Gazette from a private collection in Pittston on April 15th (file to be taken to Hazleton Campus). Since we are going to be in Hazleton area – Beck set up several site visits; i.e. Hazleton Hist. Society, etc. etc. While Beck was on the phone – I cataloged and cataloged Luzerne Co. titles. Finished 15 titles. Still more to do tomorrow and the next day and the next day. Denise worked on inputting contact people, addresses and ILL policies in the SITES disk. Must prepare for next week’s trip to Pike and Wayne. Beck made a few more phone calls in the morning and then called it quits! Enough is enough! Beck then worked on the Monthly Report. We vowed it would be short – but before long Beck was on page 7 and that doesn’t include the “extras” we attach. 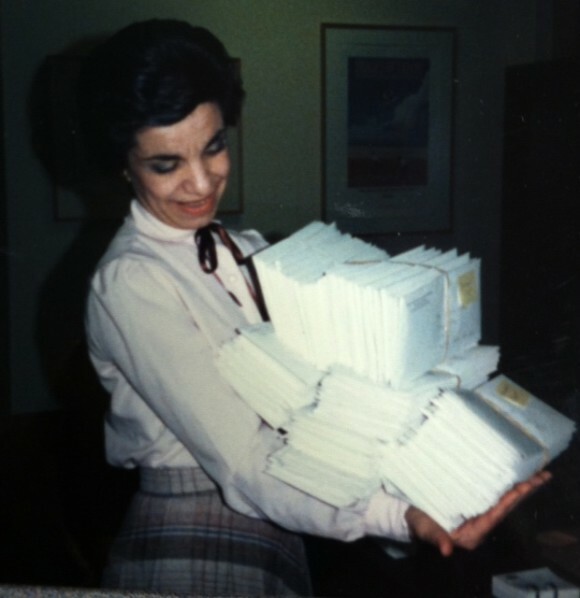 Because [her assistant] cried to Dr. Barbara Smith when we sent over “Thank you” letters to be typed, Beck decided to take the Monthly Report home this weekend and type it there. …By late afternoon Beck and I were both so tired and fatigued. I don’t think we really recovered from Luzerne. *I also input Wayne and Pike Cos. on ZAC and ran off ZAC listings to take with us. 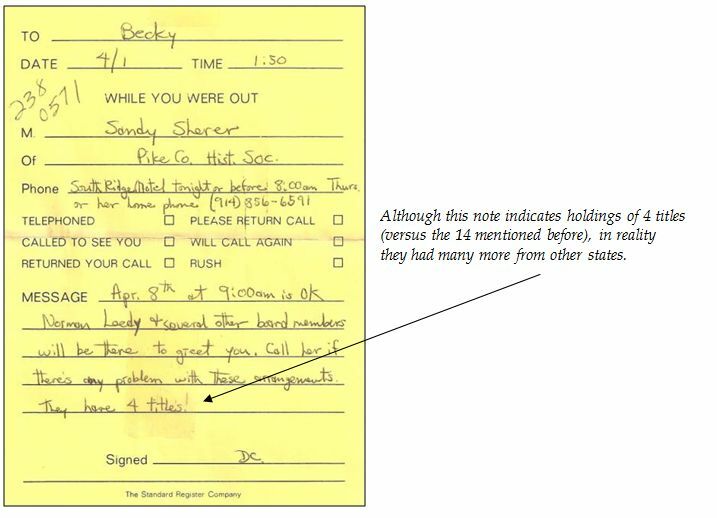 Beck took home the Monthly Report and revised it and typed it. 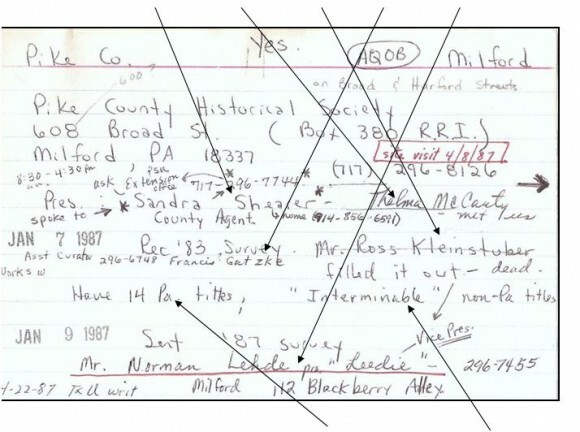 Side one of the 4 x 6 card from Master Card File, with information about site visit and holdings of the Pike County Dispatch. Dates of all communications are recorded. 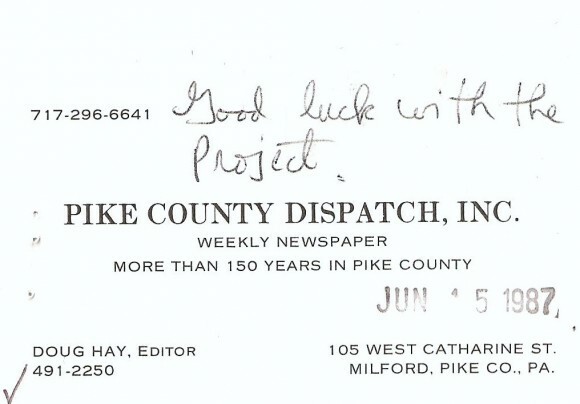 Side two of the Pike County Dispatch 4 x 6 card. 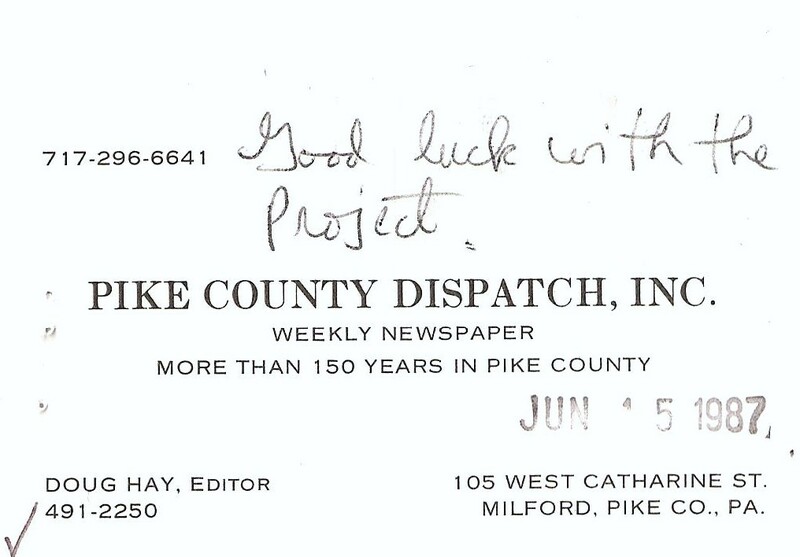 Pike County Dispatch Editor Doug Hay became very interested in the Project. was his business card, wishing us “Good Luck”. Connecting with the Pike County Historical Society was a much more involved affair, and typical of tracking down the right folks to provide access to the collections. Many historical societies are managed primarily by volunteers. Calls were made to Mrs. Shearer, Ms McCarty, Mr. Kleinstubar, Mr. Gatzke, and Mr. Lehde. Arrangements were still being put in place just a few days before the site visit to the Pike County Historical Society. Left Boalsburg at 7:56 am. (Took Beck’s car) and traveled North and East to Milford, Pike County. It was a long drive – arrived at Milford at 11:54 am. Ate lunch at Tom Quick Inn (expensive) and arrived at the Pike County Dispatch Office by 1:00 pm. Beck and I spent 2 ½ hours inventorying their collection in the basement. They had both volumes (bound) and loose issues folded and stored in boxes. After we had inventoried the basement holdings – we checked out their FM [microfilm] (PHA [State Library in Harrisburg] had the same). We had brought a portable reader along to view the film since they didn’t have one – but we didn’t need it. By 3:30 pm we left. 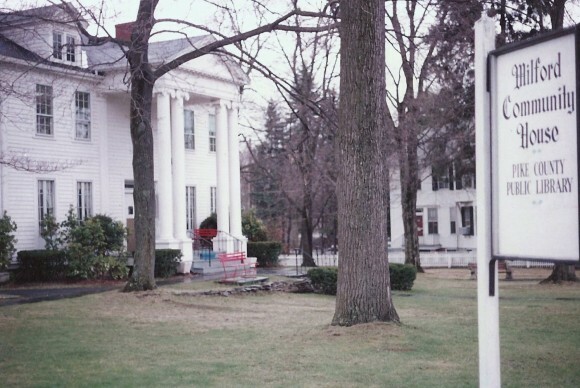 Pike County Public Library, Milford, April 7, 1987. Found a room at a Motor Lodge down the road $53.00/night! (Milford is expensive for being a tiny dink town). Milford is only 1hour+ away from NYC – many city people come to Milford for vacation, etc. Back at room – cleaned up and put workforms etc. in order. 6:00 pm ate dinner at Elmer’s. Good food. Breakfasted (also checked out) and had time to double-check some titles at the Pike County Dispatch Office. 8:30 am went to Pike Co. Court House – after checking several places w/the janitor – they at the Court House agreed that everything was sent to the Historical Society. So the Court House had nothing. 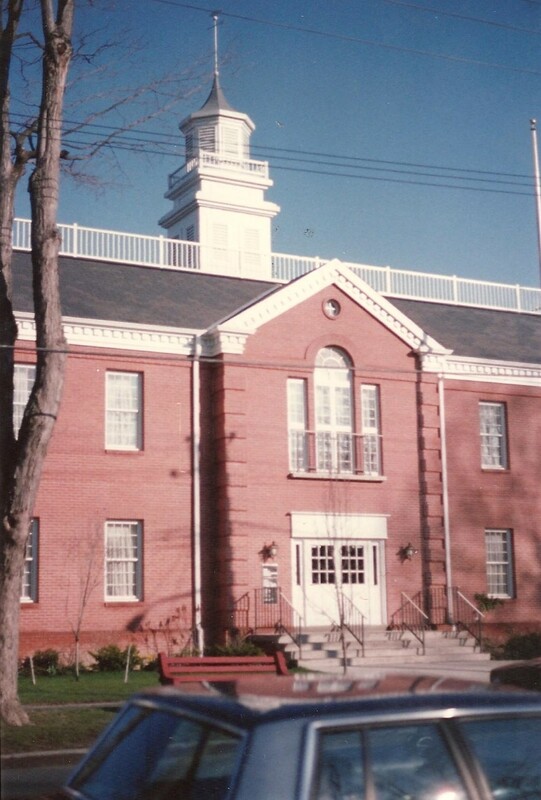 Pike County Court House Building, Milford, April 8, 1987. 9:00 Arrived at the Pike Co. Historical Society. Met w/genealogist Thelma McCarty. We talked about the project, what we were going to do – exchanged notes on Pike Co. titles, etc., etc. Soon Mr. Norman Lehde came and another member. They all showed us where newspapers were stashed here and there throughout the building. We certainly had our work cut out for us. Beck and I worked steady until 12:35 – all went for lunch. We then came back at 1:15 and worked till 3:00 pm. 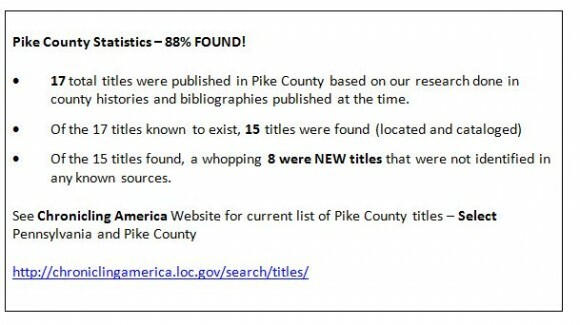 They had tons of things – we found 14 titles out of 17 = 82% for Pike County. Beck and I then headed down the road to Hawley, Wayne County. We were early enough leaving Pike Co. that we stopped by the Hawley Pub. Lib. and did their holdings. (This way we had one less thing to do tomorrow). Since we still had some time – we stopped by Mr. Phillip Hunt’s Print Shop to see if he found anything. He told Beck he had a few bound volumes somewhere – and one copy of the Pike-Wayne Gazette. Well, we stopped by – he hadn’t found the bound volumes and had even lost the P-W Gazette. He was in such a tizz! What a jerk! Beck and I left and found a room at the Settler’s Inn, a bed and breakfast place. The room was smelly and old-fashioned. The blinds didn’t even cover the windows! We worked in the room awhile – changed clothes and went downstairs to eat. Back to room – Good night! Up bright and early – up so early that the lobby was still dark. We checked out and found a diner for breakfast. 8:15 showed up at the News Eagle Office. Met w/Mr. Dyson, publisher, who showed us the backfile in the attic. 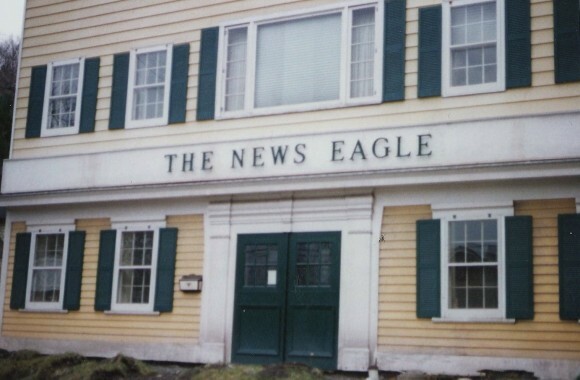 New Eagle Office Building, Hawley, April 9, 1987. There were tons of bound newspapers in the attic!! Wayne Co. News Eagle Office; Beck in Attic, April 9, 1987. Beck got Mr. Dyson to sign the release and told him more about the project and microfilming. Beck and I started inventorying and cataloging and dividing out his titles. Around 9:00 am Dr. Steers, historian and certified doctor came by to meet w/us. He had heard that we were going to be in the area (actually Beck had been trying to get a hold of him to see if he had papers). 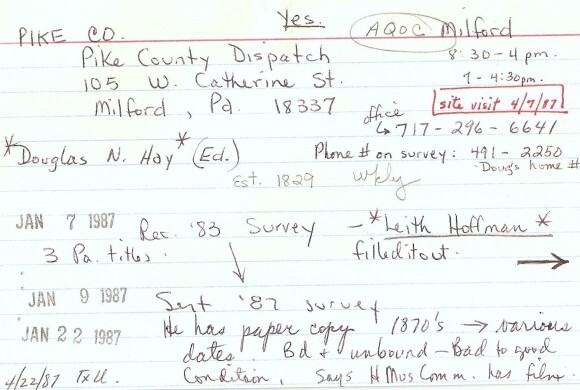 Anyway, the three of us talked Wayne Co. papers – thru his efforts Bethany newspapers that he had were microfilmed. 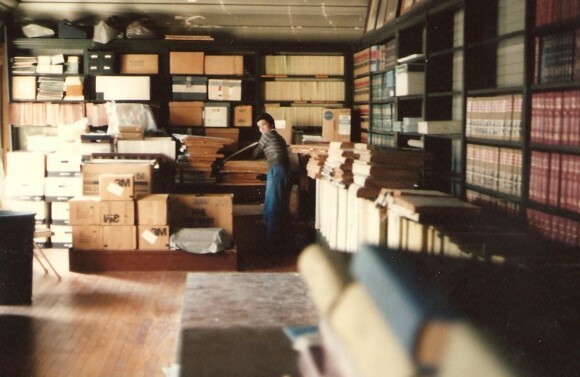 Wayne County, News Eagle Office, Attic, April 9, 1987. Dr. Steers also had a notebook full of references of newspaper names he had picked out of old newspapers. Dr. Steers really didn’t have anything we needed. But it was nice to meet him. 9:45 am we went back to work in the attic. Beck and I kept working – we found almost the whole run of the early titles that merged to form the current News Eagle. 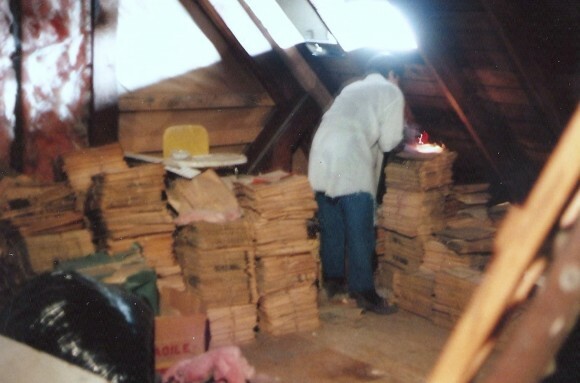 Everything in the attic should be filmed!!! We were running late – we were scheduled to be at the Wayne Co. Hist Soc at 1:00 pm. Beck called them to tell them we were going to be late. 1:40 – 1:45 Stopped by Phillip Hunt’s and sure enough he found the Pike-Wayne Gazette, which we listed. We then left Hawley and beat it down the road, 26 miles away to Honesdale. We stopped at McD’s for a quick lunch. 2:30 pm we arrived at the Wayne County Hist Soc. Mr. and Mrs. Hymes were there w/other members including Curt Reed. They had been getting newspapers ready for us – pulling them from wherever. 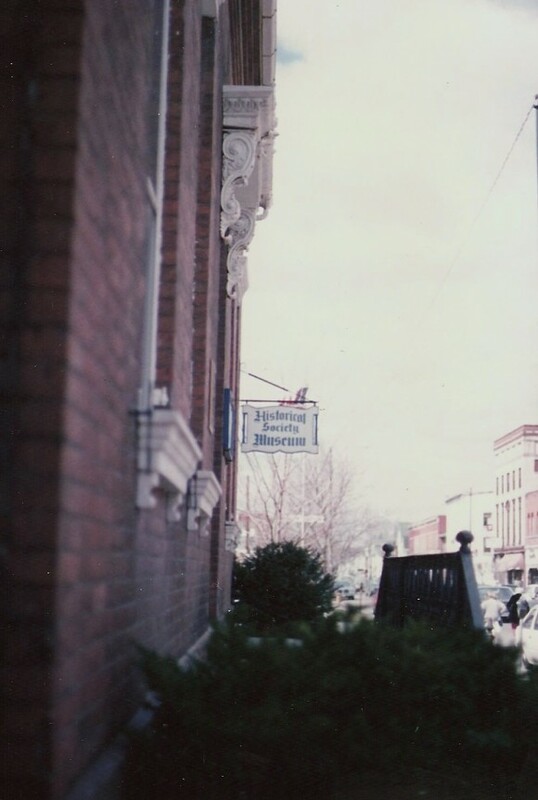 Wayne County Historical Society, Honesdale, April 9, 1987. We had only scheduled 7 hours – since they sent a Survey back w/8 titles on it and plus they said we could stay. So, we began to work on their holdings – I worked on microfilm, while Beck worked on single titles they pulled from the vault. The vault, the basement – in two places. Beck knew we weren’t going to get done anytime soon. Well, 4:30 came and they were ready to close – no way were they going to let us stay – we were so upset. They told us that we could stay when we first talked to them. Anyway, our saving grace was that there was going to be a meeting there later in the evening (6:00 pm) and we could come back then. So – we all left. We went and checked in at the Pife and Drum Motel. 6:00 pm we were back at the [Wayne Co.] Hist Soc. Beck and I immediately went to work. We got a lot done while the meeting was going on – that way they didn’t talk to us. As soon as I finished the FM [microfilm], I helped Beck inventory and catalog the titles we found in the vault. … we were given the O.K. to stay and to turn off all the lights and lock up. Beck and I both worked till 10:00pm. We finished the titles in the vault. We had to select titles we were going to include since they had tons of things – Phila, Boston, etc. and we didn’t have that much time. We really didn’t like skipping titles but we had to. 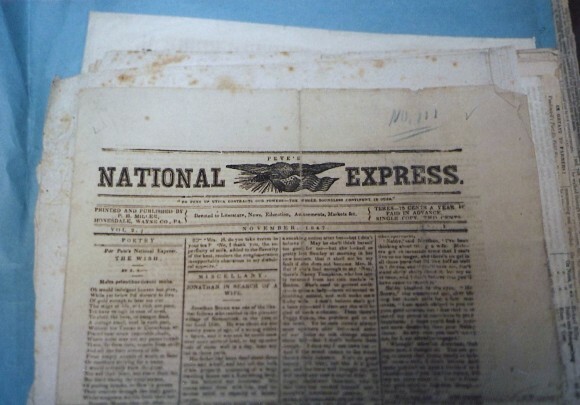 Wayne County Historical Society – only known issue of Pete’s National Express. We worked and worked clearing out the vault, section by section looking for newspapers. Susquehanna titles, Dunmore titles, etc. 10:00 we were wiped – we looked at the basement and decided it would take 2 -3 hours to finish up. We ate and relaxed and finally went to bed. We figured that we would probably need to stay overnight (Fri.) and drive home on Saturday. So we both called home to tell our families. Up early – breakfasted and headed to the Wayne Independent Office. Met w/editor Coral Ripple. We talked w/her a while and told her more about the project. She ran an impressive shop! We then inventoried her microfilm holdings. I had ÷ [divided] out the titles yesterday at the Historical Soc. so it didn’t take too long. They also had a reel of miscellaneous Wayne Co. titles which took some time to go thru. We finally left by 9:15 am. Next stop – Wayne Co. Court House. Arrived at 9:30. The Judge’s sect. showed us the bound volumes in the old library – there were 100 years worth of newspaper backfiles there. Wayne County Court House, Honesdale, April 10, 1987. Anyway, we listed everything they had (titles we had already seen – nothing new). We left at 11:30 am. 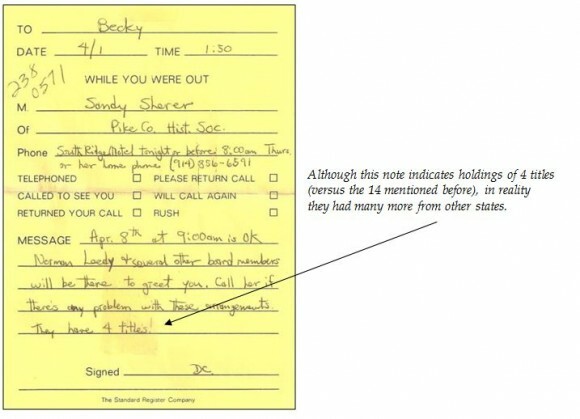 beck called Mr. Leslie from the Court House to make sure we had seen everything there – we had. Went and had lunch at a new Chinese place and killed time until 1:00 pm when the Hist. Soc. opened. 1:00 – 4:00 pm went back to the Hist Soc. 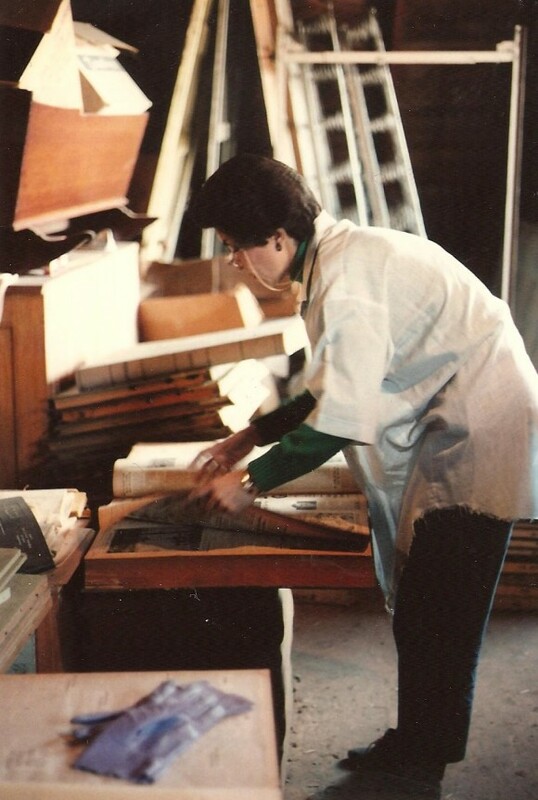 to finish inventorying newspapers in the basement. We found the Honesdale Lantern in the basement. We left, went back to our room and rested and cleaned up and around 5:00 pm left for St. Tikhon Seminary -Monastery – in South Canaan. 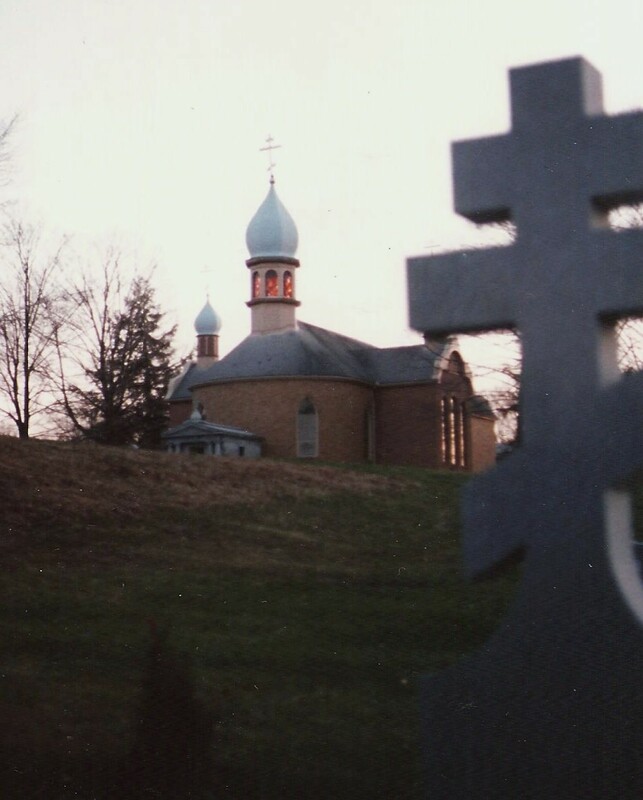 This Monastery set way out in the boonies – we traveled the old rural roads and finally came to the Seminary. St. Tikhon Seminary, South Canaan, April 10, 1987. We went thru the archway – parked our car near a Chapel – Father Anthony met us. He was wearing a long black robe, long grey hair and beard, black hat and walking w/a cane. Anyway – we three went to the Library and listed the titles – Pravda, SVIT, both in Russian. Father Anthony had to translate for us. We then drove Father Anthony to his apt. 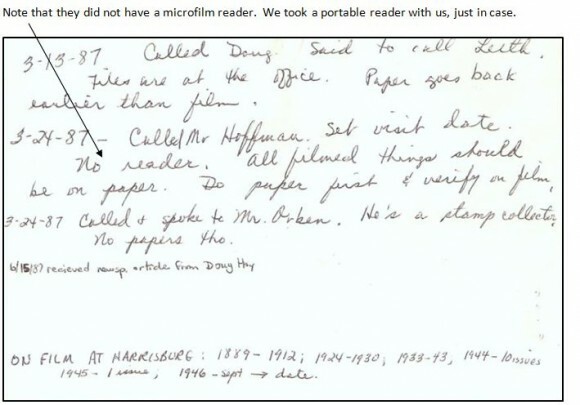 and office to list the Russko-Amer FM[microfilm] he had. 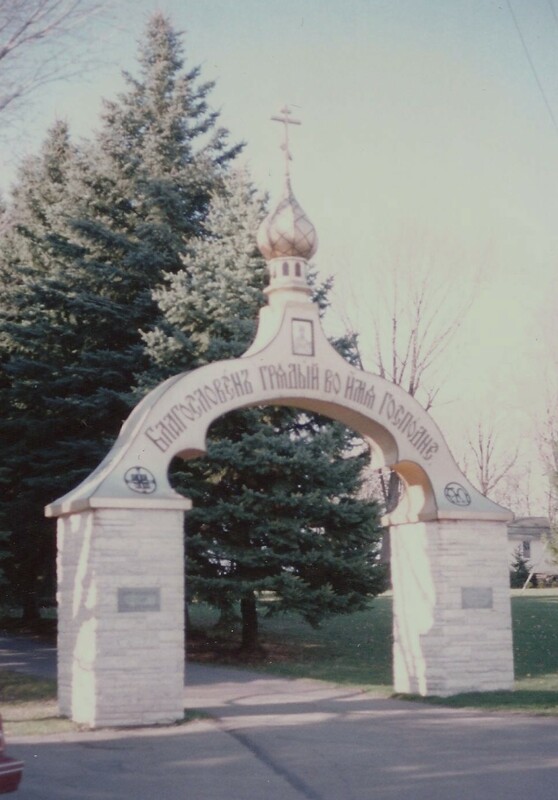 St. Tikhon Seminary, South Canaan, Wayne County, April 10, 1987. We left by 7:00 – got back to our room by 7:30pm. Went to the restaurant by the room for dinner. Back to the room and called it a night. No way could we have driven home. Up early – breakfasted downtown and left for home by 9:35 am. Beck drove all the way home…. Arrived at Boalsburg 2:00pm. Pike County was done in conjunction with Wayne County, and 82% and 77% of the titles published there were found. If anyone is wondering whether four counties are too many to be done in one month, the answer is yes! !